Most in the West, if asked, would say that the Second World War began on September 1, 1939 when the German Wehrmacht invaded Poland. A different response would come from the citizens of China, who see 1931 as the beginning of the world’s most devastating conflict. In that year, in the far northern Chinese region known as Manchuria, members of Japan’s Kwantung Army (an army created by Tokyo for the purposes of guarding a Japanese-owned railway in northern China) carried out a “false flag” bombing in order to pin the attack on a Chinese warlord. Known later as the “Mukden Incident,” this operation not only created the Japanese-backed state of Manchukuo, but it also began Japan’s steady encroachment on Chinese territory. Peter Harmsen’s Storm Clouds over the Pacific is a brief, but informative account of Japan’s actions in China, Mongolia, and Southeast Asia prior to the surprise attack on Pearl Harbor on December 7, 1941. Harmsen’s book details some of the lesser known conflicts in Asia, from the border war between Thailand and French Indochina to the border war between the Soviets and the Japanese. Both of these small but intense wars would factor into Japanese military thinking in 1941. For instance, the conservative Japanese Army had long seen communist Russia as the chief enemy in Asia, but Japan’s defeat during 1939’s Battle of Nomonhan convinced many that the Russian bear was better left alone. As for the clash between Thailand and the French, it convinced the U.S. that Thailand was supportive of the Japanese regime. However, this information was not enough to persuade the US Navy to send ships and men in order to help the French in Asia, who were then loyal to the pro-German Vichy government. Storm Clouds over the Pacific moves back and forth between on-the-ground battles, rear echelon discussions, and larger diplomatic conferences involving Tokyo, Washington, London, and Chongqing (the wartime capital of the Chinese Republic). Very little is glossed over in this book. Harmsen takes his readers through the battles of the Chinese “quagmire” to the visceral and bloody streets of Nanjing in 1937. In doing so, a few themes come to the forefront. First, the Japanese government, even when it was taken over by arrogant and jingoistic military officers, knew that it could not win a protracted war against the United States. Second, the colonial powers of Great Britain, France, and the Netherlands were ill-prepared to fight the Japanese, despite seeing plenty of war clouds prior to 1941. Third and finally, Japan’s desire for an Asian empire was doomed from the start when their military made the fateful decision to commit millions of men to fighting both the Chinese Nationalists and the Chinese Communist insurgents. China would not only prove to be the Imperial Japanese Army’s largest graveyard, but it was also the biggest conundrum, as Tokyo never fully thought about what its goals were in China. 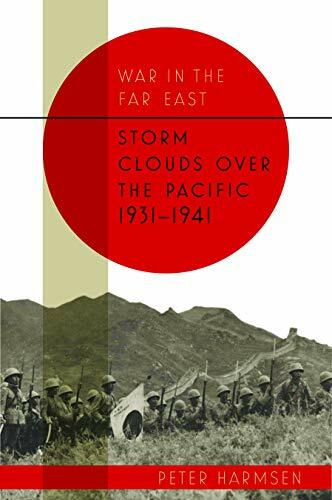 Storm Clouds over the Pacific is an excellent primer about World War II in Asia prior to the involvement of the United States, and furthermore it is an excellent resource for understanding the relationship between China and Japan, past and present.